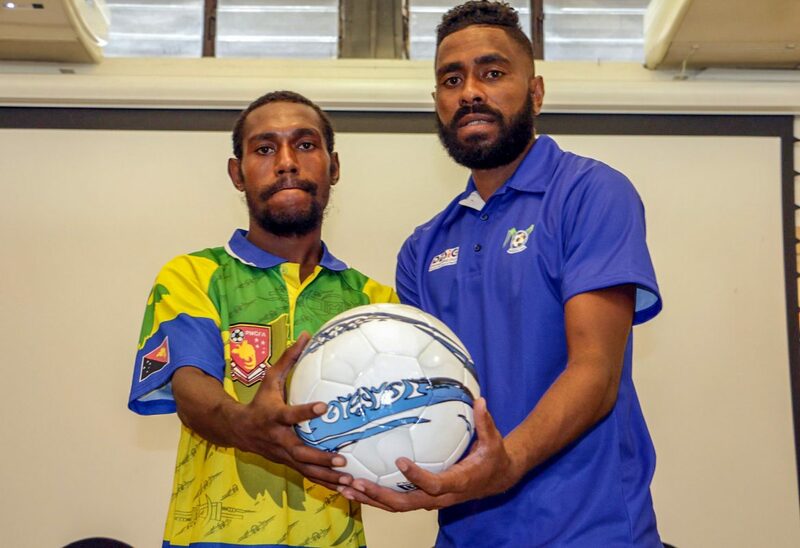 FC Morobe Wawens captain Fidelis Namuesh and Lautoka vice captain Samuela Junior Drudru posing for a photo. Photo: Avikash Chand. The OFC Champions League 2019 group stage is about to commence in Fiji and all four teams drawn in Group B are full of confidence ahead of their respective matches at Churchill Park on Sunday. The stake is high in Lautoka as two quarter-final places are up for grab in Oceania’s premier international club competition. Hosts Lautoka reached a historic final last season under the guidance of Kamal Swamy only for the Blues to hit the deck at the hands of Team Wellington 10-3 on aggregate in the two-legged final. Swamy recruited two players Vanuatu international Bong Kalo and Hawks Bay United Daniel Allan to strengthen his pack. Speaking at a press conference today in Lautoka, Swamy confidently said that his boys are ready to fancy their chances at home. “I think we are well prepared and we would like to see we go further, we will take each game at a time to see how we perform in these three games in this group,” he said. “This is a different tournament, deferent level of football and we’re preparing well for this O-League. “Our spectators give us a morale booster but we will be also under pressure because our fans always want our team to win. Tahiti Ligue 1 champions AS Central Sport also make known of their intentions to compete in the group. AS Central president, Eugene Haereraaroa said they are determined to do better in only their second OFC Champions League appearance. “This is our second time qualifying for the O-League, we were in New Caledonia two years ago,” he said. In the competition’s history, KOSSA, Koloale, Marist and Solomon Warriors always compete with the Solomon Islands flair in the Champions League and adding to the list is new faces Henderson Eels. Henderson Eels qualify for the OFC Champions League in their second season in the Solomon Islands S-League. Former KOSSA coach, now at the helm of Henderson Eels, Eddie Marahare said he is confident his team is prepared to compete. “We are happy with how our team settled well in Lautoka and since Monday we have been enjoying the Lautoka weather,” he said. “In terms of preparation, I am happy with the preparation. This is the first time for the club to play in the OFC Championship but it’s not first time for couple of our players. Eels captain Boni Pride stressed that the team has set its ambition high despite making their first appearance in the tournament. “My expectation for my team Henderson Eels, I believe this is our first time to come here to Lautoka for the Champions League,” the Solomon Islands international said. The ‘Surprise Pack’ as they like to be called in the tournament, FC Morobe Wawanes captain Fidelis Namuesh is beaming with confidence ahead of the clash with the hosts. “It’s our best time to compete in a big tournament like this, my boys will give their best. “I trust my boys, we are ready to take on Lautoka tomorrow,” Namuesh told the press. Debutants, Henderson Eels of Solomon Islands will be taking on Tahiti champions AS Central Sport in the opening match at 1pm (FT) while hosts Lautoka will start their campaign against another debutants FC Morobe Wawens of Papua New Guinea at 4pm at Churchill Park.